Details relating to the Greek Commemorative of 2004. 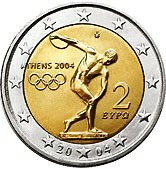 This is first Euro Commemorative Coin minted and was occassioned by Greece's hosting of the 2004 Olympic Games in Athens. 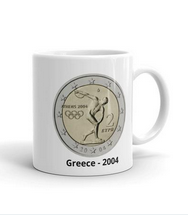 The commemorative coin replaced the standard two euro coins of Greece in 2004, none of which were minted in that year. The motif chosen to adorn this first commemorative coin (which was to be followed by hundreds more) was that of the statue of the discus thrower of Myron (an ancient Greek sculptor). The ancient statue forms the central motive in the inner circle and is surrounded by the 12 stars of the EU. On the left one sees the venue and minting year “ATHENS 2004” and immediately underneath the five Olympic rings. The value 2 Euro is shown with Euro written in the Hellenic script. This is very unusual (and I believe against regulations) as the value of all Euro coins is supposed to only appear on the common side. Above the athlete's head, the mint mark(Acanthus Leaf) can be seen. If you look carefully at the base of the statue,then on the left you can see the famous (or as some students may say infamous ) pi ?? . On the right of the base are the initials (KK) of the artist. The year of minting is shown at the bottom – it is spread around one of the EU stars. The year is normally shown with nothing intruding between any numbers although this representation does occasionally appear on other Euro coins. Return from Greek Commemorative 2004 to euro coin collector.